In middle school, I participated in the “egg drop” project: Design a package that protects a raw egg from breaking when dropped from a high place. It was a fun exercise, and I think the egg pods that performed the best employed many layers of materials in their design: bubble wrap, crumpled paper, plastic baggies, styrofoam. For supermarket egg cartons, there are different standards of excellence. A commercial egg carton needs to be light, stackable, and cheap. 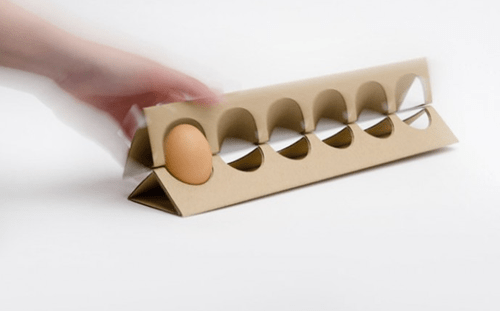 The egg carton design that we’re all familiar with has been in use for over a hundred years, but perhaps Hungarian design student Otília Erdélyi has happened upon something better. 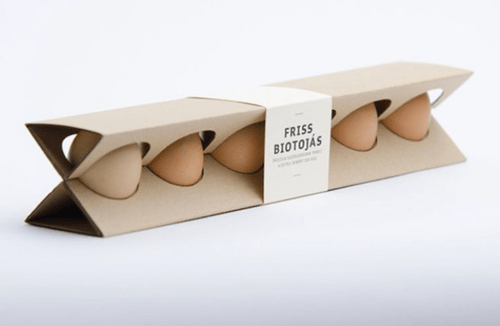 Erdélyi’s design, labeled “Friss Biotojas” (meaning “fresh organic eggs” in Hungarian), is made of a single sheet of finely corrugated cardboard, folded into two triangles with ellipse-shaped holes in the middle. To retrieve an egg, you simply bend the top to the side a bit, and bend back to close. It holds six eggs, which is usually the amount I buy. 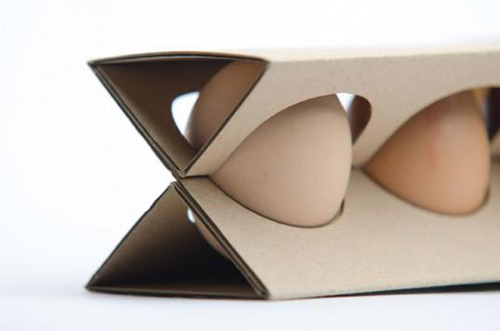 The design is stackable and reportedly uses less cardboard per egg than the ubiquitous egg carton design, so who knows? Maybe you’ll be seeing some version of this on your supermarket shelf in the near future. In any case, I like to see people playing with smart package redesign ideas. However, for the record, I am NOT on board with the plastic water bottles that are so thin they practically crumple in your hand as you drink the water.